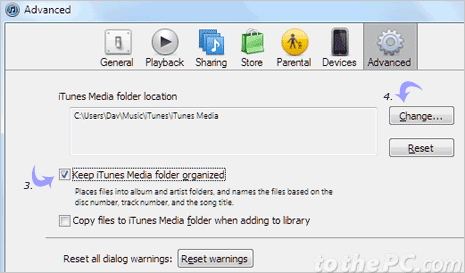 iTunes application program is all about managing and accessing media files. 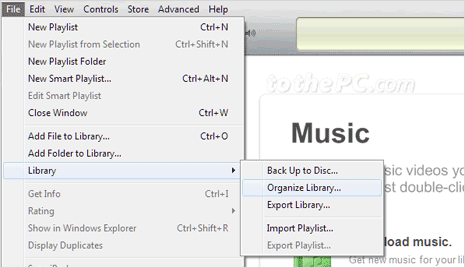 You browse, organize and playback audio and videos files easily using iTunes program. With media files taking lot of hard drive space, you may want to relocate them to a different drive or partition folder location on your computer. For example: if your primary C: hard drive has less free space – you may move and transfer iTunes media folder (& files) to different hard drive parition for better usage of free space available on different drive partition. Fortunately, iTunes provide option to easily change media folder location and automatically copy all media files to new folder location. 1. Open iTunes program. Then goto Edit > Preferences from the top menu bar. 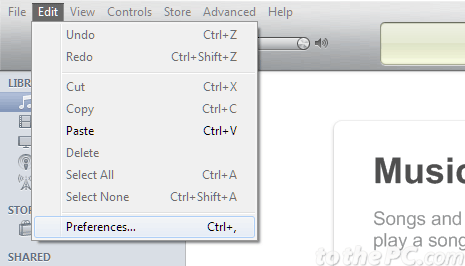 You can also use Ctr + , shortcut to open Preferenced window. 2. In the opened window, click Advanced tab to access options we need to change iTunes media folder location. 3. Click to check “Keep iTunes media folder organized” option and click OK button at the bottom. Then open Preferences window again and click Advanced tab option (repeat steps 1 and 2 as above). 4. Now click Change button next to ‘iTunes media folder location’ option. This will open ‘change iTunes medis folder location’ dialog box. 5. Browse to folder that you want to select for iTunes media files and then click ‘Select folder’ button at bottom right part. Click OK to close Advanced preference dialog box. 6. Now goto File > Library > File Library in Tunes program. User with older version of iTunes should goto File > Library. This will open Organize Library dialog box. 7. 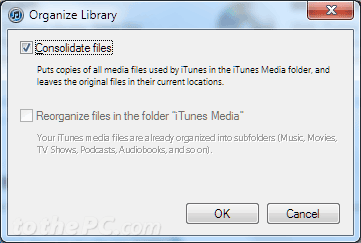 Click to check option ‘Consolidate Files’ – this will make copy of iTunes media folder files at new selected folder location in iTunes setting. After copy, it will still leave original files in the older media files folder. Then click OK to begin consolidation of media files to new folder location. 8. After this, you may delete previous media folder (with still contain original copy of media files). Locate that folder (should be at: C:\Users\username\Music\iTunes\iTunes Media), make sure you replace username with your actual usersname on Windows PC. 9. Then close iTunes application and open it again. Now iTunes will use files contained in new media folder. If you get any error, try recreating new folder using above steps. Alternatively, you can restore original media folder from recycle bin trash.